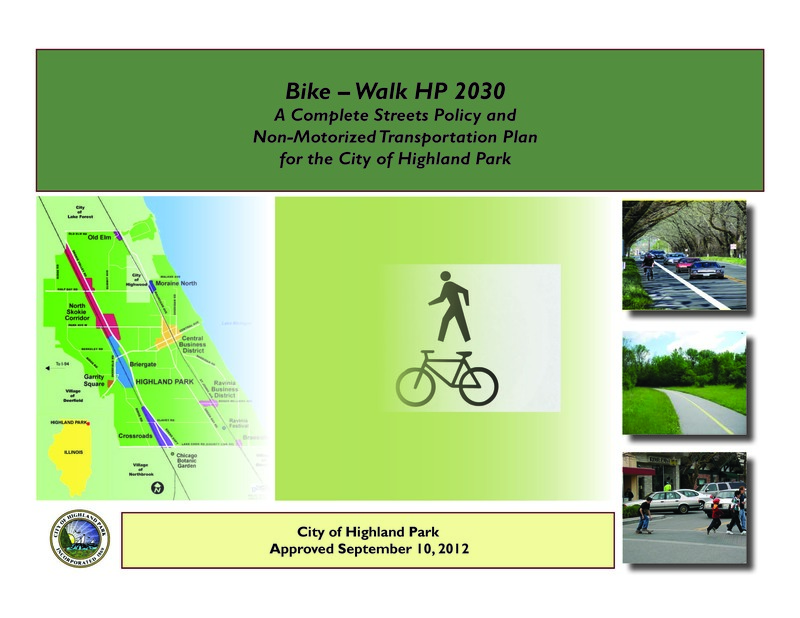 In 2012, the City of Highland Park adopted BikeWalkHP 2030, the City’s comprehensive bicycle and pedestrian plan. Since its adoption, the City has implemented several of the recommendations in the plan, including a pedestrian cut-through and 18 miles of bicycle infrastructure improvements. In 2018, the City was awarded a Bronze status as a Bicycle Friendly Community by the American League of Bicyclists, one of only 19 Bicycle Friendly Communities in the state. Why is the City Updating the Plan? The City seeks to continue serving as a bicycle- and pedestrian-friendly community through the implementation of BikeWalkHP 2030. Updates to the plan are needed to reflect new bike infrastructure and pedestrian connections, as well as to re-evaluate project priorities. The updated plan has been named MoveHP. The project kicked-off with a meeting of the MoveHP steering committee. The steering committee is comprised of community stakeholders including the Park District of Highland Park, residents, bike-enthusiasts, and every-day walkers. The committee will work closely with staff to serve as a sounding board and ensure the plan meets the needs of the Highland Park community. In addition, the schedule includes multiple opportunities for public input and presentations to City Council. The MoveHP process is anticipated to conclude before the end of 2019. This includes analysis of existing conditions, public outreach, drafting the plan, and adoption. The City will be hosting a drop-in Community Workshop to gather feedback for MoveHP. Please join us any time during workshop hours to provide feedback! 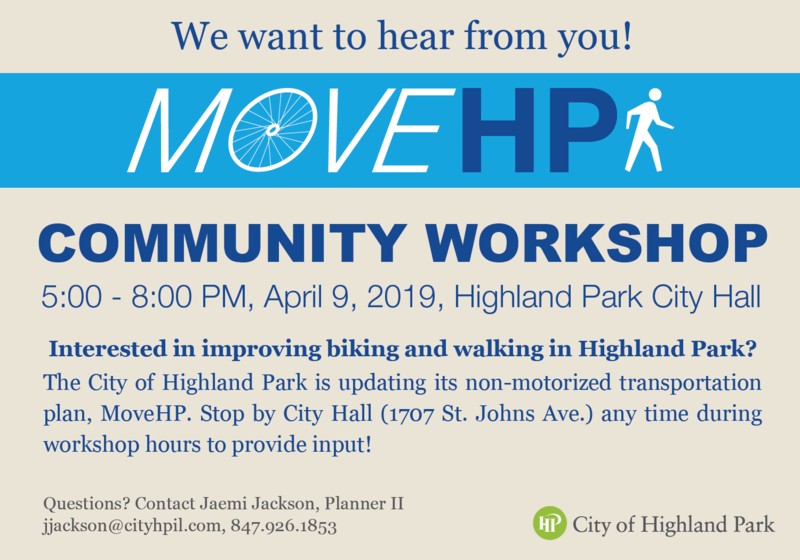 Place: Highland Park City Hall, Pre-Session Room, 1707 St. Johns Ave.
Can't make the community workshop? Please take 5 minutes to fill out an online survey to help us prioritize pedestrian and bicycle improvements in Highland Park!